Now we all want to see convicted criminals in the prison system speedily rehabilitated. 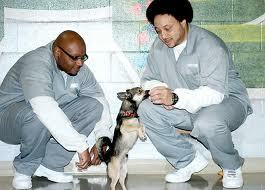 We also want the prisoners to learn empathy and useful life skills while serving their sentences. That’s all great, so why does the idea of prisoners training assistance dogs in jail makes me vaguely uncomfortable? ‘Maryland’s prison agency says it’s teaming up with a guide-dog group to have inmates train service dogs for wounded and disabled military veterans. Public Safety and Correctional Services Secretary Gary Maynard and leaders of America’s Vet Dogs were set to announce the program Monday at the Maryland Correctional Institution near Hagerstown. The link between crime and animal abuse is recognised and well known. As much as I want to see inmates speedily rehabilitated, I don’t want that to come at the expense of putting dogs at risk of animal abuse.